In the U.S., about two thirds of us have smartphones now. And, we can hardly go a day without hearing about another terrible thing they're doing to our lives. Yet, despite everything, we love them. We can't fathom life without them. 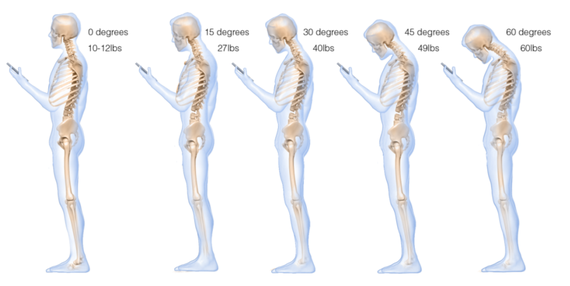 Isn't it time to (at the very least) give your smartphone-holding body a postural assessment? A new paper has identified just how much weight that weird texting position can put on your spine. The study, published recently in the journal Surgical Technology International, calculates the approximate weight we put on our cervical spines when we're in the classic, hunched-over Texting Pose (which is not part of any sun salutations we've encountered). They found that the weight of the head on the neck and spine increases the more we hunch over. So, if your neck is straight up, it's just carrying 10-12 pounds (the weight of an average human head). But, if your melon is tilted forward by 15 degrees, that impact goes up to 27 pounds. At 30 degrees, you're up to 40 pounds. This added weight can cause pain that some have referred to as "text neck," a term popularized by Florida chiropractor Dr. Dean L. Fishman. According to his site, this change in posture causes long-term strain that can lead to pinched nerves and even arthritis. Although there isn't much definitive research here, we do know that sitting and staring at a computer for long periods of time isn't the greatest for our posture or our health in general. Which makes "text neck" just one of many reasons to put down the tech and get out of the chair.